The Food Network Blog is kicking off their season long Fall Fest 2011, which welcomes food and garden bloggers to feature garden-to-table recipes and tips. We’ll help you to enjoy all that this season has to offer. First up is the autumnal favorite: apples. Here is my contribution: Besides prayer, what could be a better way start to your day? These Wholegrain Apple Oat Pancakes will show your family how very much you love them. As a child, with napkin ready, I loved watching my mother make pancakes. I loved seeing the air bubbles form and knew that I was only moments away from sinking my teeth into her delicious pancakes. I recently created this recipe for my family and they have requested it several times since! 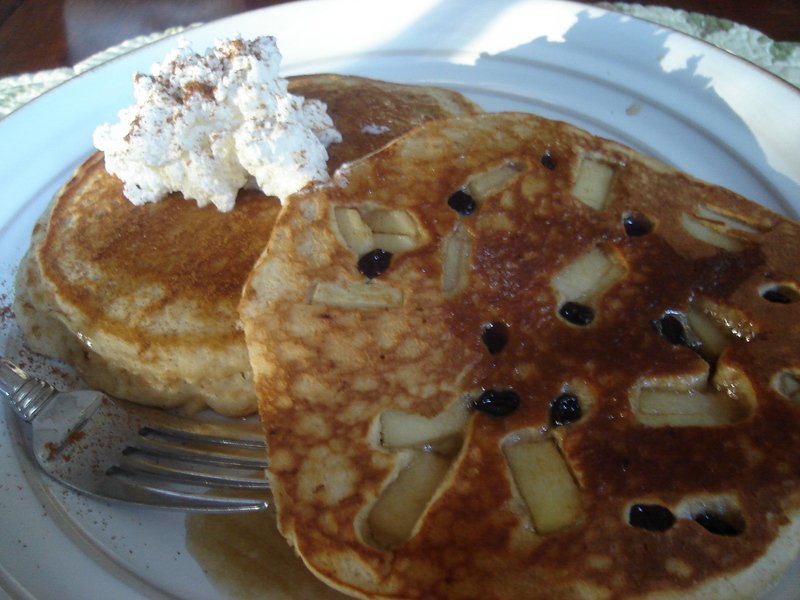 The currants and apples add such a nice sweetness to these delicious and fluffy wholegrain pancakes and the toasted pecans add texture and a nutty flavor. In a dry skillet, toast your pecans for a few minutes to bring out the flavor. Be sure to cook the pecans on medium heat and stir as not to burn them. In a large bowl combine, oats, both flours, baking powder, baking soda, cinnamon and salt. Mix. In another bowl whisk together eggs, olive oil, almond or vanilla extract, milk and vinegar. Add wet ingredients to stir until combined. Spray your griddle with a non-stick cooking spray. (I like to use my cast iron griddle). Ladle some of the batter for each pancake. Get your spouse or kiddies in the kitchen to help you place some of the chopped apple and currants over top of your pancakes. Kids are great mixers, too! Wait until you see bubbles begin to form, but watch for browning on the bottom-turn your heat up or down accordingly. Pour over some pure maple syrup and enjoy! 12 Comments on "Wholegrain Apple Oat Pancakes"
yummmy!! I was so ready to post about Fall fest! But my computer just crashed and all the files are gone. Now recovering hard drive on Hubby’s laptop Your recipe looks divine Thanks for sharing. Thank you, Grishma! I saw Sarah’s email; God bless your heart! I felt so bad for you. Hope we get to see your recipes as I can’t wait to try it! Knowing you, it will be fantastic! these looks delicious, must try it! Hope you love them as much as we do, Diane! Thanks for stopping by! Wow do those look fantastic. I can smell them cooking in your lovely kitchen right now.